Finding a better solution by making small adjustments to your current solution is usually a good idea. The key word is "usually." 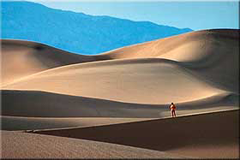 Dunes in Death Valley, California. Dunes are of course transitory, moved about constantly by wind action. At the time of this photograph, we can see several possible "hill peaks" of the kind we imagine when we use hill climbing algorithms. Looking at the photo, it's easy to understand how hill climbing algorithms can be captured by local maxima, thereby preventing them from finding even higher maxima. Photo courtesy U.S. National Park Service. Finding the extreme values of functions is a common problem in mathematics. For instance, one form of the famous "traveling salesman" problem involves finding the shortest path that a traveling salesman can follow to visit all customers in a given district. Algorithms for optimizing functions are called "hill climbing" algorithms if they work by gradually improving a solution, adjusting its attributes one at a time. The hill climbing metaphor comes from imagining the function's value as being the altitude of a point in a geographical region. To find the highest point in the region, we take one step at a time, always uphill. By always climbing uphill, we hope that we'll find the highest point in the region. The metaphor is so powerful that hill climbing algorithms are called "hill climbing" even when we're minimizing something instead of maximizing. There's just one problem: hill climbing doesn't always work. For example, suppose you're unlucky enough to start your optimizing on the shoulder of a hill that happens to be the second-highest hill in the region. By always "moving uphill" you will indeed find the peak of that second-highest hill, but you'll never find the highest hill. In effect, the algorithm is "captured" by the second-highest hill and it can't break free. That's unfortunate, because we use hill climbing often without being aware of it. For instance, when we hire people, we look for attributes that we feel will ensure that we hire the best. One such attribute is experience in efforts exactly like the ones we anticipate. Even though identical experience doesn't necessarily ensure future success, we use experience because we believe that it will take us most steeply "uphill." It's possible, of course, that someone with a different experience background might be just what we need to achieve even better results. But we'll never know, because the current solution has captured us. aware of ithappens in problem solving too. When we're familiar with one solution, we tend to focus on filling out the rest of that solution, rather than seeking a completely new approach that might lead to a far better solution. Such new approaches are sometimes said to arise from "thinking out of the box." And most tragically, hill climbing can lead to the downfall of an entire enterprise. A company that's dominant in its market can become captured by the particular way in which it meets customer needs. Even though it searches constantly for innovations, it seeks only those innovations that preserve certain attributes of its current offerings. When a competitor enters the market with a wholly different approach, that competitor can prevail if its solution gives the customer a path to a "higher hill." Think airlines and railroads, iTunes and record stores, or iPhone and Blackberry. Would you like to see your comments posted here? rbrenWLeJzFaghbYWlznMner@ChacoDaTlYuLlxMCFdlRoCanyon.comSend me your comments by email, or by Web form. Once you find a task that you can tackle as a "barn raising," your work is just beginning. Planning and organizing the work is in many ways the hard part. Adages, aphorisms, and "words of wisdom" are true often enough that we accept them as universal. They aren't. Here's Part V of some widely held beliefs that mislead us at work. I offer email and telephone coaching at both corporate and individual rates. Contact Rick for details at rbrenRYIbqLdPFomwcmAhner@ChacNtdTqKiJvkOqWFCroCanyon.com or (650) 787-6475, or toll-free in the continental US at (866) 378-5470.